Plus over to the south east in the Fraser Range, a discovery that you may have heard of before – the recent Sirius’ Nova discovery. The map above shows the mines and deposits marked with blue circles. Following a boom in the 1970s, the discoveries have started to dry up on this nickel belt. SGQ are hoping to uncover the next frontier – their land is completely unexplored for nickel sulphides and contains ultramafic rocks that are similar to the profitable Agnew-Wiluna belt. SGQ believe that the next big discovery in their patch to the east may happen here. Early stage scout drilling by BHP has supported this thesis. And in just a matter of days SGQ will be firing up the drill rig again – and a steady stream of assay results will be coming through in the coming weeks. 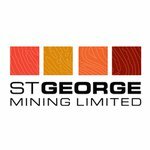 Did you receive The Next Small Cap article on Segue Resources (ASX:SEG)? Since this article was released, SEG has been up as high as 130%. So not only did SGQ get the farm, they also got the farmer! 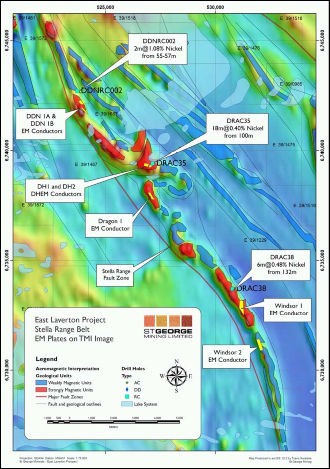 BHP spent 2 years exploring and scout drilling methodically proving up the targets, and drilled 35 RC (reverse circulation) holes for 8,560m during Project Dragon. In fact, 28 of the 35 holes intercepted geology strongly indicative of a big nickel sulphide deposit lurking in close proximity. 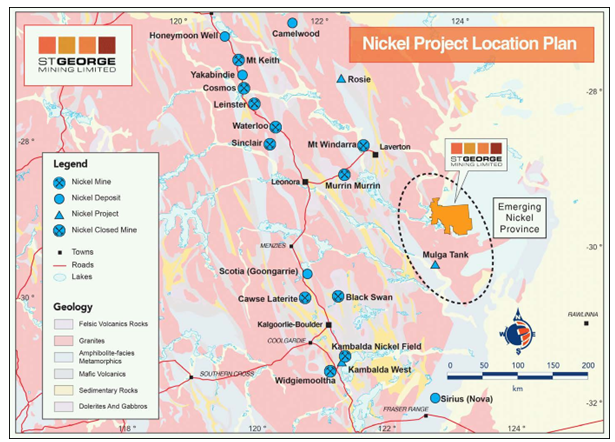 The Angew-Wiluna belt is the most significant nickel belt in WA, boasting some of the world’s largest komatiite-hosted nickel sulphide deposits – and created BHP’s gargantuan Mt Keith operations, which hosts 335 million tonnes of nickel sulphide. Pentlandite was also identified in multiple holes – a very high grade form of nickel sulphide. 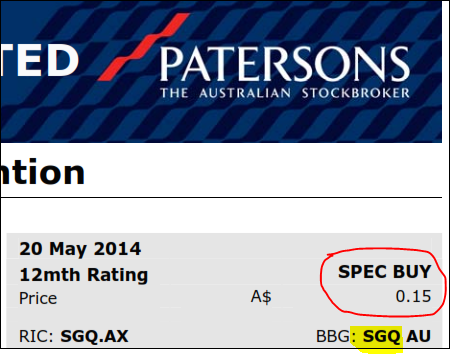 So if SGQ can find a deposit – it’s likely to be high grade, as well as large. 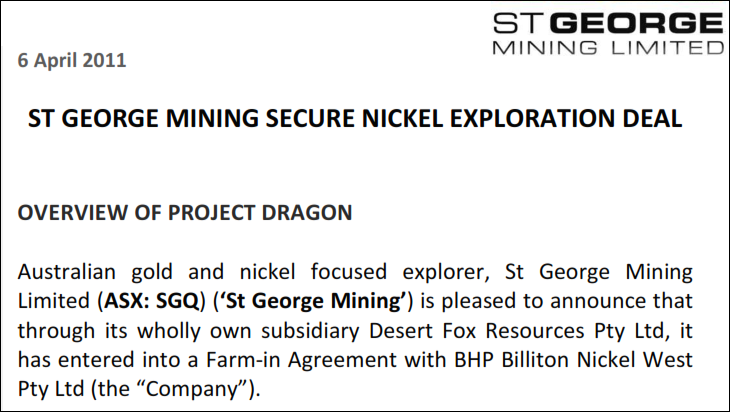 BHP spent $3 million and did a lot of work proving SGQ’s theory of a new nickel province... And then just handed over all that priceless information to SGQ for absolutely nothing! So a ‘big company’ project is back 100% in SGQ’s lap, a small, well-run explorer with a market cap currently less than $12 million. And now, SGQ is free to complete exploration, and without the limiting boundaries that were in place to cordon off the previous joint venture areas... And have 100% exposure to any finds they manage to make. To stay up to date with all the latest SGQ news, follow them on Twitter or like them on Facebook . The free float is the number of shares that will actually be made available to buy on market. With less than 80 million shares on issue, the free float with SGQ is VERY small. This means that in the event of a big nickel discovery, the share price may go parabolic as investors scramble to get in. As investors, we don’t like to be one of the scramblers chasing higher and higher prices. The only way to avoid this is to take a position early, while some uncertainty remains. There’s nothing better than seeing upper management holding on to a big chunk of shares as a long term investment. With SGQ, management hold 1/5th of the entire issued capital. The top 3 holders control a whopping 40% of the register. And the top 20, who won’t be daytraders looking to flip stock for a quick profit, currently own 61%. So the free float is really only about 32 million shares... if SGQ can prove up something big, then a decent parcel of shares might be very difficult to come across. 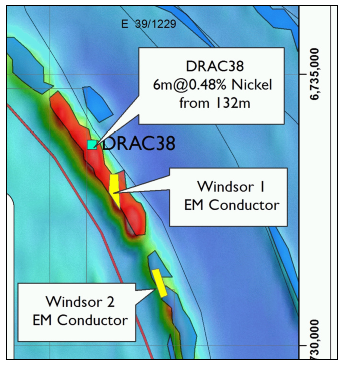 Early stage drilling at East Laverton has uncovered large scale, high magnesium oxide ultramafic sequences, just like Agnew-Wiluna, that support the “big nickel” theory. The big takeaway here is that there has been no previous nickel sulphide focused exploration, just like the Fraser Range pre-Sirius. SGQ spotted the nickel potential before anyone else, did the science, and now BHP has left the party they will be 100% sole recipients of potential rewards. 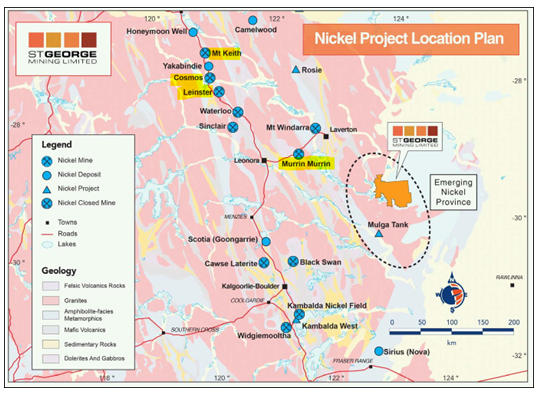 A further two new conductors have been identified at the nearby Windsor nickel prospect. The second Windsor conductor has also been given a Category 1 ranking by Newexco. 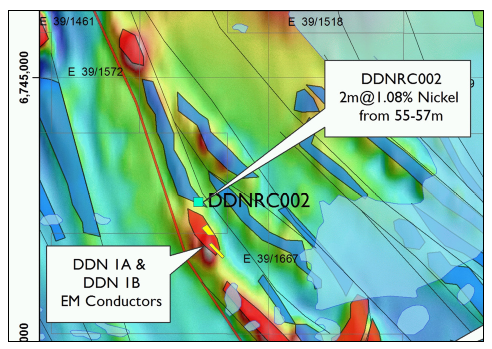 SGQ is aiming for a different style of nickel deposit than Sirius – SGQ’s targets are not “eye-features”. East Laverton is a different geological setting, but the virgin nature and level of prospectivity is looking somewhat like the Fraser Range before Nova and Bollinger were discovered. Sirius has probably discovered most of what lies within their tenement boundaries. To be honest here at the Next Mining Boom , big discoveries don’t really excite us after they have been factored in to the share price. Sirius is now capitalised at $685 million, and shares are trading at around $2.60... great if you bought at 10c, but now it might be time to start thinking about the next big thing. The good thing about SGQ is that they only have about 1/3 of the shares on issue that Sirius has... 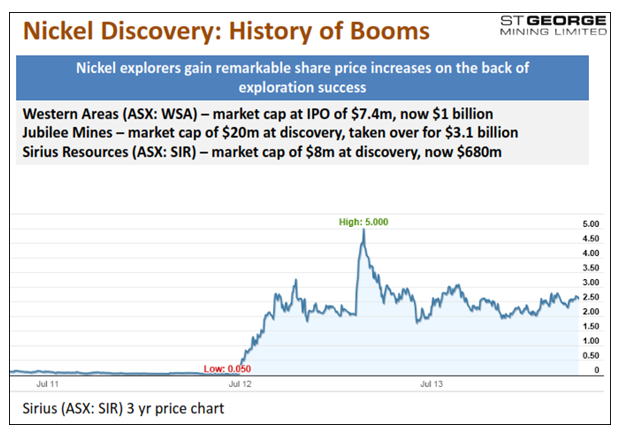 So if SGQ get lucky and make a discovery, even if it’s only half as big, the rise in share price may be similar. SGQ is very tightly held, 20% owned by management and the top 3 shareholders own 40% of the company. Plus the senior geologist from BHP responsible for the project just crossed to the SGQ camp. The management team has put their money where their mouths are. Does the company have a small market cap? 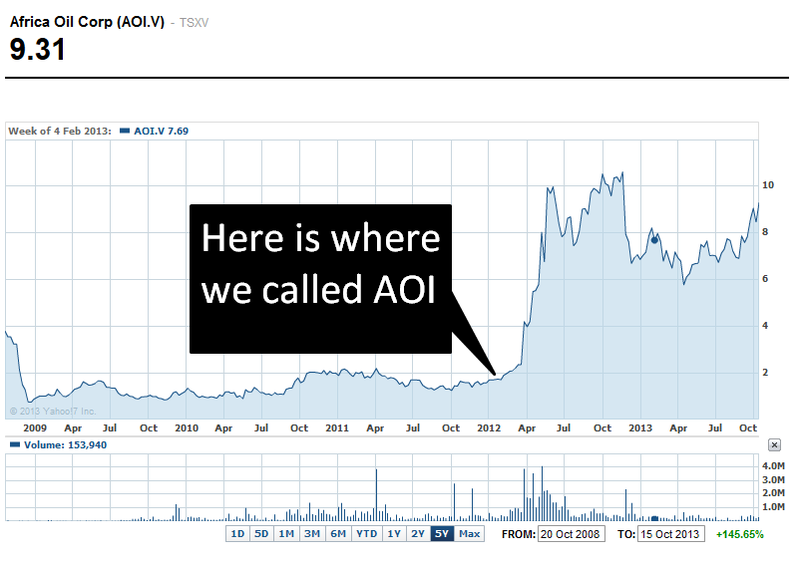 SGQ is currently valued at less than $12 million... They have just raised over $1 million in a heavily oversubscribed capital raising . 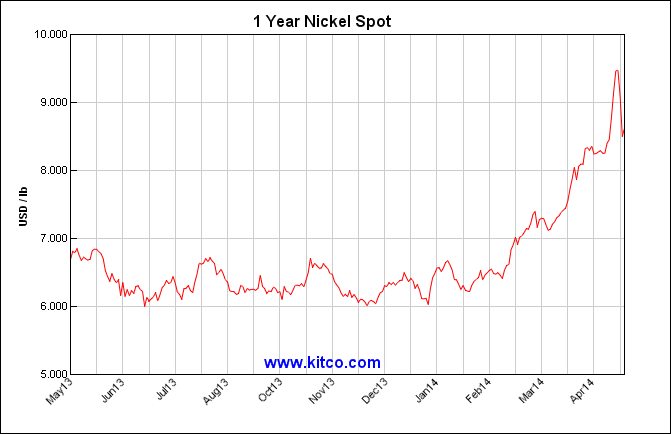 Combined with the tight share register any big nickel discovery may spark a very sharp and sustained move north. Are there upcoming price catalysts? In just days SGQ will commence their high impact drilling campaign. In a few weeks assays will start flowing onto the screens of investors across Australia. 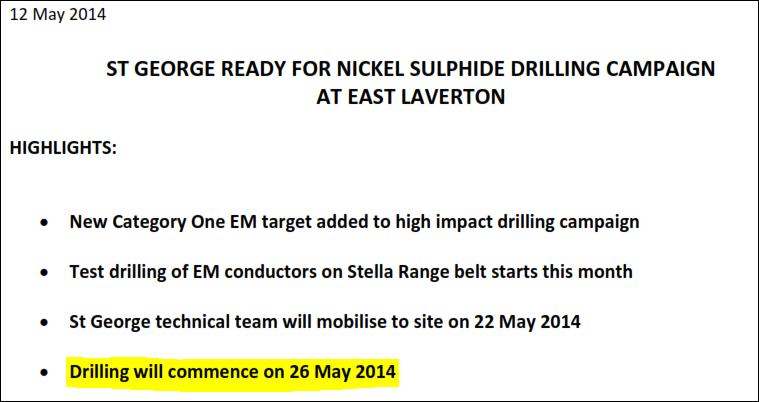 In parallel, SGQ is continuing electro-magnetic work to further refine even more drill targets.